Well played, Moon****. Well played. P.S. I see there’s a patchlet available today for World of Warcraft, version 1.12.1, which will take 38 years to bittorrent. No time like the present, DO IT NOW!! This entry was posted in World of Warcraft Journal and tagged gaming, screenshots, warcraft, world of warcraft by Foton. Bookmark the permalink. 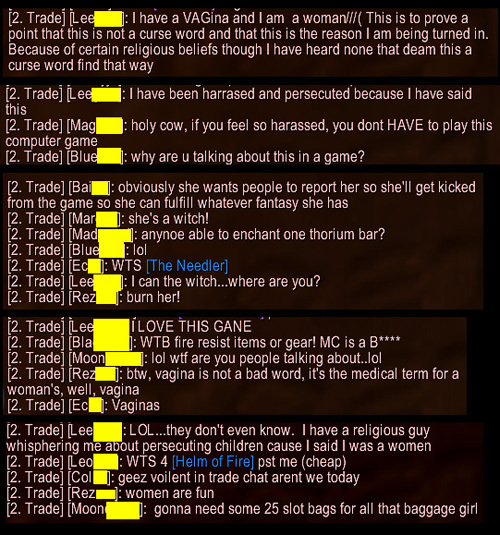 I give 50/50 odds, at least, that the woman in question was actually a guy… I swear, most of the women I know who play WoW won’t admit it for the life of ’em unless they get to know you first. I just laugh to my husband when people call me “dude” and let them think I’m a guy, cause it’s a hell of a lot easier that way. And yeah, hell of a funny conversation, either way! You have no idea how much amusement this has brought to my otherwise boring work day. You win the internet sir!